David Ruffin provided more professional and personal fireworks. This Jimmy Ruffin biography salutes the less spectacular but still-admirable accomplishments of the older sibling. Jimmy beat David into the world on May 7, 1939 in Collinsville, Mississippi. With a minister father and musical genes that would also develop in David and cousin Melvin Franklin, Jimmy's spirituality and sense of song merged in church gospel music. 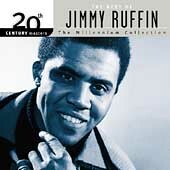 As a session singer in the 1960s, Jimmy Ruffin arrived at other settings bearing his gifts. One of those places was called Motown, which assigned him to the Miracle subsidiary in 1961. The U.S. soon roped him into the Army, so like Miracle itself, his stint with the label didn't last long. Upon his return to civilian life, Motown approached him with a tempting Temptations offer, but he suggested that a different Ruffin--David--fill the vacancy left by Elbridge Bryant. Jimmy Ruffin ended up on the Soul label, but didn't find much fortune until 1966. Fellow languishers the Spinners were supposed to cut a rather forlorn song about unrequited love. In tune with its mood, Ruffin beseeched one of its writers to try him instead. With his sincere vocals, "What Becomes of the Brokenhearted" became an instant Top 10 R&B/pop classic and the pinnacle of the Jimmy Ruffin biography and discography. The song did boost his standing and made way for other notable pieces like "I've Passed This Way Before," "Gonna Give Her All the Love I've Got," and "Don't You Miss Me a Little Bit Baby." But "Brokenhearted" would be the singer's only huge hit in over a decade. Despite the prolific writers behind such songs, Ruffin had to look overseas for most of his public support. The U.K. stood by him with "I'll Say Forever My Love" and "It's Wonderful (to Be Loved by You)." Ruffin earned much adulation there as a live performer. And at the start of the 1970s, a British poll crowned him one of the world's finest singers--alongside Elvis Presley! If any rivalry of the sibling variety existed, it didn't prevent Jimmy from singing with the newly solo David. The Ruffin Brothers' work included the album, I Am My Brother's Keeper, and a cover of "Stand by Me" by Ben E. King. The pairing didn't turn out to be that fruitful, though, and Jimmy Ruffin continued on his solitary way, away from Motown. Polydor and Chess gave him singles and/or albums, but no major smashes. In 1980, RSO gave him all of that with Bee Gee Robin Gibb's production of "Hold on to My Love." Ruffin's popularity shot up once more. It afforded him notable solo efforts like "There Will Never Be Another You" five years later, and duets with female artists both early and late that decade. One of those singers, Brenda Holloway, was a comrade from Motown and at Motorcity when he joined the latter in 1988. Like many artists confined to Motown's lower tiers, Ruffin didn't find the highest chart rankings or the biggest creative achievements. But his soul signature--"What Becomes of the Brokenhearted"--remains in the clouds. Not so unhappy an ending to this Jimmy Ruffin biography after all! Has this Jimmy Ruffin biography got you searching for more Motown oldies singers? There is a place for beginning: the homepage!